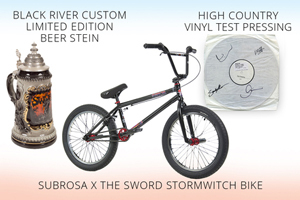 In celebration of the release of their fifth album, High Country, on August 21st, THE SWORD announce today a contest where fans can win prizes including 10 Subrosa X Stormwitch bikes, 10 custom designed SWORD beer steins, and 30 autographed vinyl test pressings of High Country. The contest is going on now and runs through Friday August 28th. To enter the contest, fans need to upload a receipt from the purchase of High Country and fill out an entry form at the contest page. Those who haven’t purchased the album are still eligible to enter the contest by reading the rules and conditions section of the contest page.